This Is America Tour of North America reinforced with Hyperreal Sound technology, Kara and K2 arrays, driven with LA12X amplified controllers. 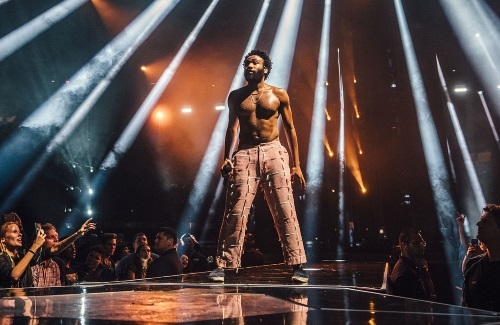 Emmy and Grammy winner Childish Gambino (Donald Glover) has announced that his “This Is America Tour” is his final trek. Britannia Row is supporting his latest North American tour with L-ISA Hyperreal Sound technology from L-Acoustics. To widen the sonic panorama and add dimension to the 20,000-seat, sold-out arenas on this tour, the L-ISA Scene system provided by Britannia Row comprised three center arrays of 15 K2 flanked by a pair of 21-enclosure Kara arrays. For increased horizontal spread, four arrays of 15 Kara were flown, two per side, outside of the Scene system as an additional L-ISA Extension system, while two arrays of 13 K2 were deployed to provide coverage to the seats on the extreme sides of the stage. Palpable low frequency coverage was delivered by two adjacent center hangs of eight KS28 each, flown in a cardioid configuration, while an additional eight ground-stacked KS28 provided LF reinforcement to the near-field audience. Six Kara spread across the stage lip provided front fill, and the entire system was driven by LA12X amplified controllers housed in LA-RAK II touring racks.